On one of the first really warm March days of the season, Bob and I enjoyed a walk to our local park. 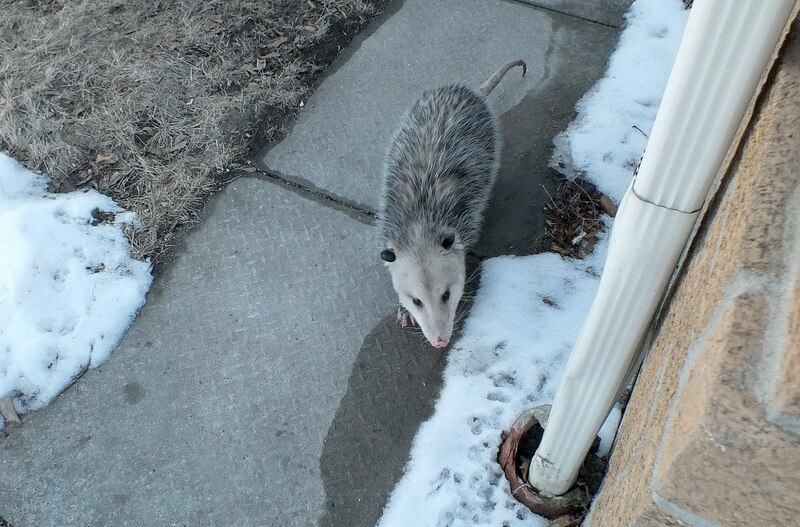 We were thrilled to see an Opossum scouting around for some food there amid the snowdrifts, and it reminded us of the three that had visited our own backyard in late December. We had seen no sign of them since then. 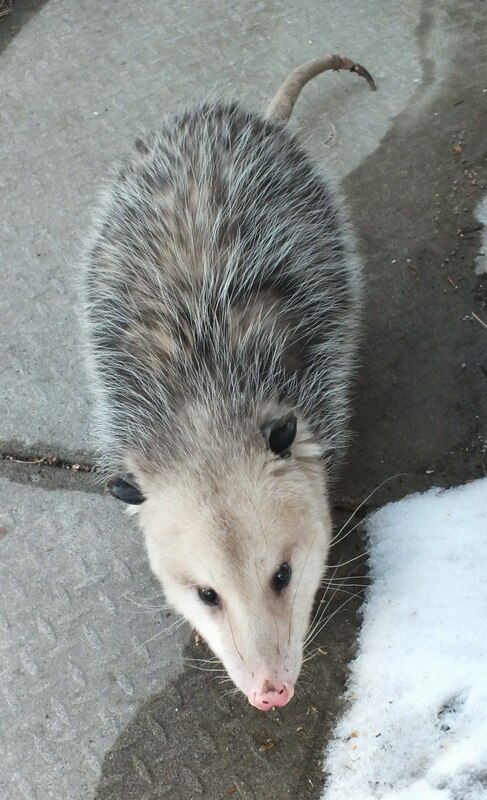 We were no sooner home from the park when a little visitor came calling…a very large Opossum (Didelphimorphia). It seemed quite at home sauntering along the bare sidewalk alongside my house and probably was enjoying the warmer surface on his little pink digits. Finally, the snow was beginning to melt away after a brutally cold, snowy winter. 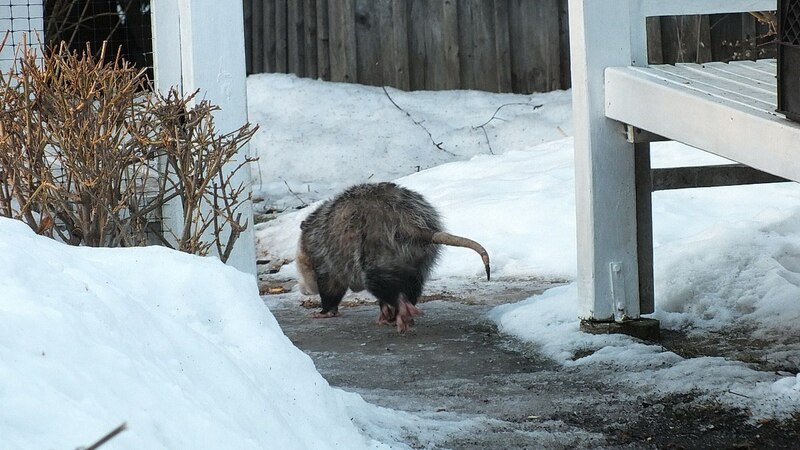 Bob had dashed out the front door to try for a photograph, and sensing his presence, the Opossum turned tail and headed back towards my garden gate. 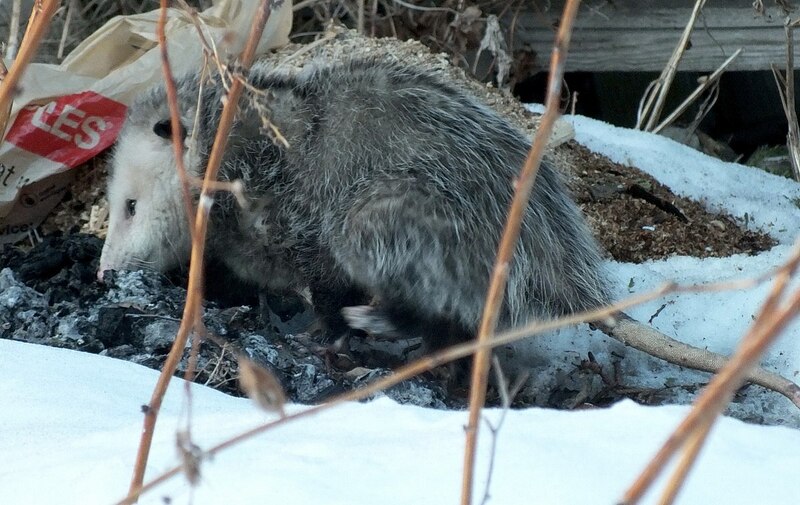 The Opossum’s tender, delicate feet are very susceptible to frostbite, as are its hairless tail and ears. Opossums have opposable thumbs on their hind feet, and all five digits on each foot are separate giving the animals unique and distinct footprints. They are the only species other than primates to have opposable thumbs. 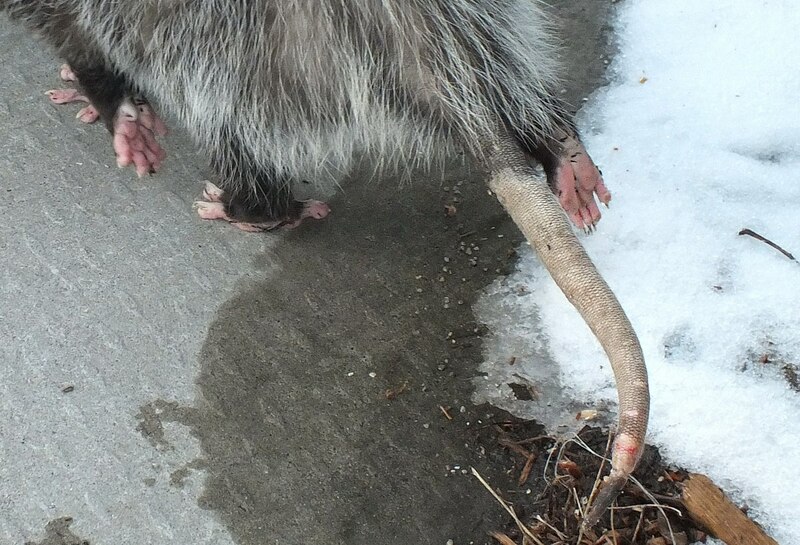 It would appear that this Opossum suffered a bit of damage to its tail as the surface appears abraded. 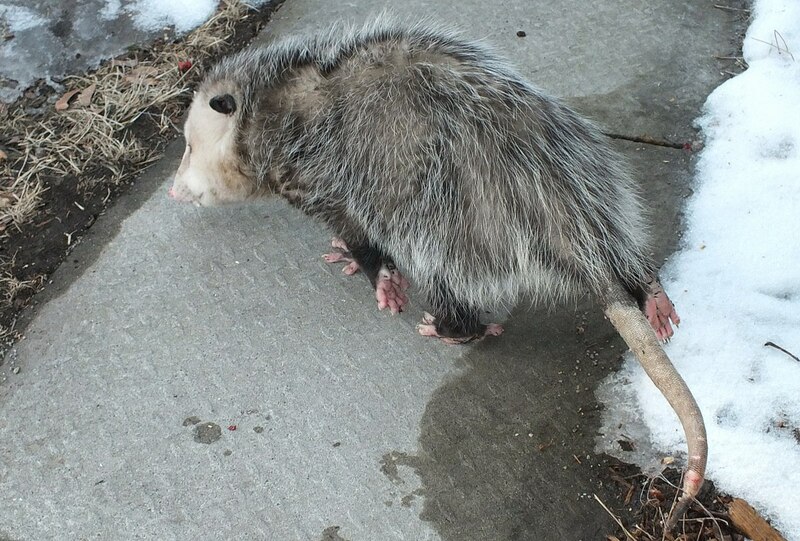 An Opossum uses its tail to grasp things so it comes in very handy when climbing. It is the only North American mammal with a prehensile tail. 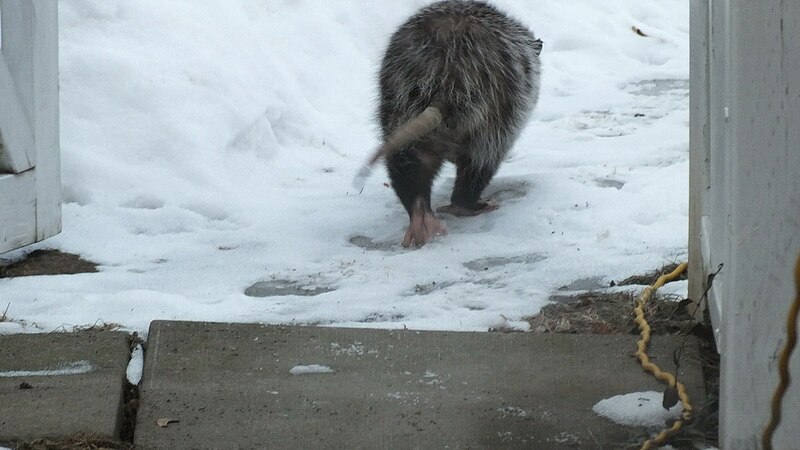 Surprisingly, the tail is also used to store extra fat, so Opossums are able to survive when there is a lack of food. 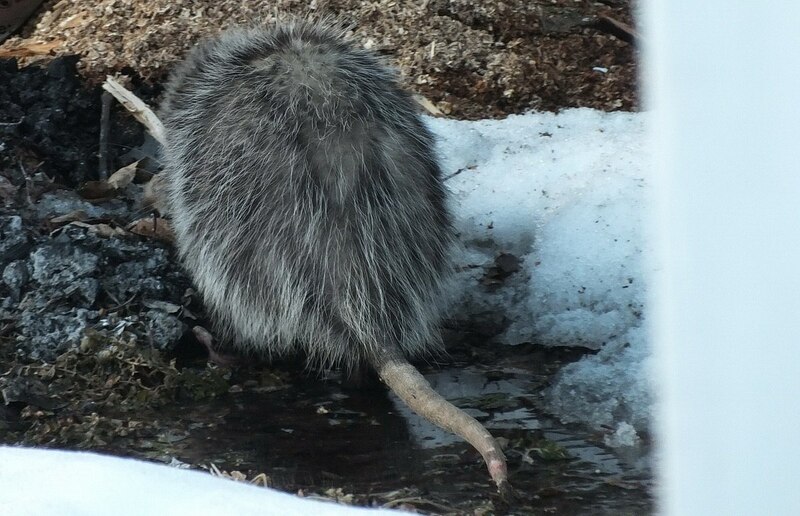 I guess our backyard, with tidbits of birdseed beneath the feeders and a few mushy, fermented apples now showing themselves through the melting snow, is a beacon to any Opossum looking for a snack. The open gate provided no deterrence. and a few tasty apples had escaped the ravenous squirrels. but it finally revisited the bare spot in the vegetable garden before disappearing beneath the chain link fence. 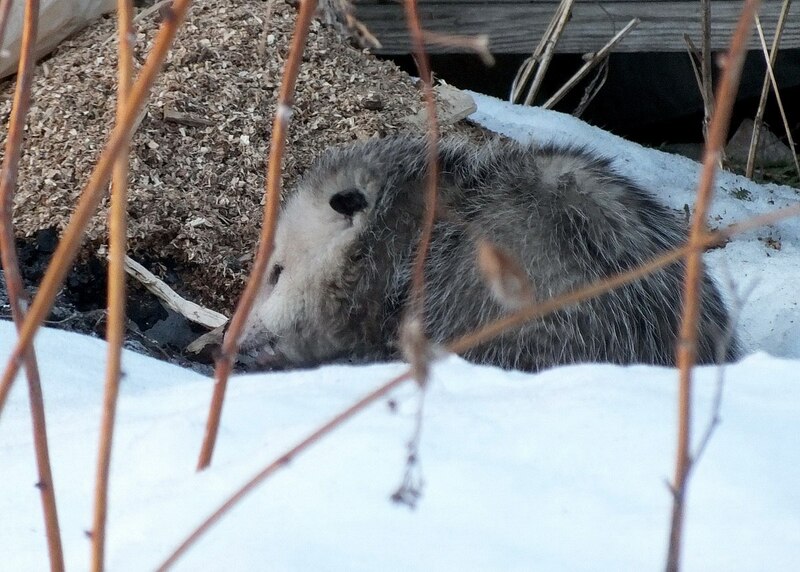 The Opossum was huge as compared to the three we saw in December and the one spotted only the day before, so we wonder if perhaps a family of Opossums will soon become the norm on our property. I’m not too sure what I think of that idea! They are cute, mind you, but so are raccoons, and we know what a nuisance they can be.